PHILADELPHIA, PA – January 22, 2018– Janney Montgomery Scott LLC (“Janney”), a leading full-service wealth management, financial services, and investment banking firm headquartered in Philadelphia, PA, announced the opening of a new location in Columbus. 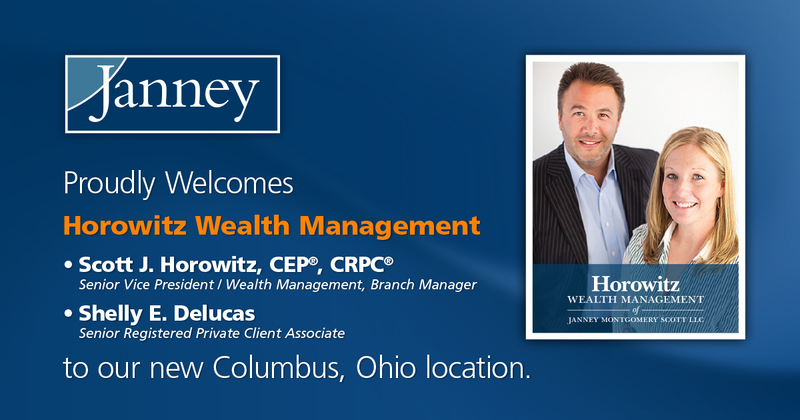 This branch becomes Janney’s eighth office location in Ohio. Joining the new Columbus location is Horowitz Wealth Management, comprised of Scott Horowitz, Senior Vice President / Wealth Management, and Shelly DeLucas, Senior Registered Private Client Associate. They were formerly affiliated with Raymond James. Horowitz will also serve as Branch Office Manager. Horowitz, Senior Vice President / Wealth Management, Branch Manager, has over 17 years in the financial services industry. He has earned the advanced designations of Certified Estate Planner™ and Chartered Retirement Planning Counselor™. He earned a Bachelor of Science degree from The Ohio State University and attended the Regent’s University in London, England, where his studies included marketing and management. He supports a number of local community organizations, including the Arthritis Foundation of Central Ohio as a member of its Central Ohio Market Leadership Board. Janney’s new location in Columbus, OH is located at 325 John McConnell Blvd, Suite 415 Columbus, OH 43215.